I thought of this, as I looked at my sausage and scrambled eggs. Out of curiosity, last week I called the Wyoming Office of Tourism, posing as a tourist, to ask whether there are any restaurants in Dubois. You know, it’s a pretty small town. Sure, she said. There are places to eat there. You know, Moms and Pops. I recognized her tone of voice: the big-city cognoscenti. I’ve been there myself, for many years, in a much bigger town than Cheyenne, where she was speaking from. “Moms and Pops” are not, well, cool. I was waiting for my car repair across the street at 3D Oil, this week, and I stopped by for breakfast at the Village Cafe. Not the place the Office of Tourism would recommend, clearly. Their promotional material tends to focus on the Cowboy Cafe, which has the right branding. A fine establishment itself, but always crowded in the high summer season (therefore). I guess nobody had told her about the Bistro, which is pretty darned cool itself. You can usually get a table at the Village Cafe. It’s quiet season now, only a few hunters and retired ranchers stopping by for breakfast. The old guys at the next table were talking about cattle, tractors, and hay. The other folks were quiet. There was a nice, hometown feel about it. I sat back and read my book while I enjoyed my eggs. In Dubois, we thrive on Moms and Pops who started their businesses years ago and stay around because we love it here, and (like the couple who just opened Noon Rock Pizza) the kids of Mom and Pop, who start something new because they want to live here. Or the couple who opened Moose Outpost, the hamburger stand across the highway, which rivals Wendy’s for quality but not for brand recognition. I’ve always admired the big screen TV at the front of Village Cafe, which features real facts about our history and geography, like this one. So folks passing through can learn a little about the area with their hotcakes and hash browns. The menu is sparse: Eggs, sausage, bacon, pancakes, French toast, in various combinations at corresponding prices. Nothing fancy. You know what you’re going to get, and it’s pretty good. “A chain restaurant would never survive here,” said Dustin, coming out from the kitchen to talk with me. “They wouldn’t be able to make it through the slow season.” For that, you need the Moms and Pops who are committed to the community and determined to stay in this place they love. Of course because I live here, I have never actually stayed in the Wind River Motel, which is attached physically and financially to the Village Cafe. From the outside, it looks modest, to say the least. I’m not sure I would stop here myself if I were a stranger passing through. In recent months, I’ve taken the opportunity to speak to several people who have stayed there — a man from Colorado who brings up his truck full of peaches and tomatoes in late summer, and a pair of cyclists passing through from coast to coast. They told me it’s a great deal: good beds, very clean and comfortable, and the price is definitely right: Well south of $100 a night, about a third what you’d pay over the pass in Jackson. There are those who won’t stop in Dubois because we don’t have a Hyatt or even a Holiday Inn Express. We’ll manage just fine without them, thank you. We’re OK with who we are: Moms and Pops and folks who just like it here and want to keep it this way, which is pretty wonderful. The health care facilities are merely useful. This will be magic. As spring brings life to the valley, an enchanting new creation is unfolding beside the highway, just east of the rodeo grounds. What makes the place seem even more magical is that it used to be a toxic waste site. It’s difficult to imagine what might have been toxic about the sawmill that gave life to this community, until it closed in 1988. But an EPA document describing the “brownfields” cleanup project says the site was contaminated with petroleum byproducts including benzene and diesel fuels. Ten years after the mill closed, a local family bought the site and donated it to the Nature Conservancy, stipulating that it should be used for the “health and enjoyment of the citizens of the greater Dubois community and its future generations.” After the town gained numerous grants, the cleanup began five years ago. The medical clinic, fitness center, and assisted living facility on the site clearly qualify in the health category, but as mere buildings they would not inspire the words “enchanting” and “magical.” As the dog and I enjoy the eastern end of the river walk, I’ve seen something emerging that will clearly deserve that description. The good folks of Dubois Anglers and Wildlife Group (DAWGS) are busy completing Pete’s Pond, the dream of Pete Petera, a former director of the Wyoming Game and Fish Department who retired to Dubois. I knew the bright-eyed gentleman all too briefly before he passed away, too early to see the project begin. Pete wanted a place where children could enjoy fishing safely. The need for this becomes clear as I follow this part of the river walk in late May, watching the surging water breach its banks and crash past, frothing and muddy. DAWGS long ago made the river accessible for handicapped anglers along this riverwalk. Now, on the landward side of the walk, they’re busy with backhoes creating not just a pond, but a whole new park. There’s a small stream at the inlet, and islands in the center of the pond. It’s a pleasure to think that this is what future travelers will see first as they pass into Dubois headed toward Yellowstone and Jackson. After that long desert drive from Rawlins or Casper, they will be enticed as they reach Dubois to stop and enjoy birds and gently lapping water, lined by trees and bordering the river. It doesn’t yet look as green as it will, because it’s only early spring here, and the work is still under way. But I can already hear the laughter of the children. Somewhere over there under the water is a ball that the dog lost in the weeds last summer. He’s certainly forgotten about it. I’m very pleased to make the sacrifice. One up-side of remoteness: The high cost of production. Back when I first lived in New York City, it really used to trouble me that there was so much violence in films set in my home town. But as time went by, I stopped caring about that. In decades of living there, I never personally witnessed gun play or other violence (setting aside 9/11, of course). The French Connection was released way back in 1971, the same year I fell in love with my husband and his home town. Starting then, I grew accustomed to ignoring the bad rap about violence and crime that frightens so many tourists about New York. So what? I know better. These days, I really enjoy watching films set in New York. It’s fun to recognize the intersection the cops are running through or the exact spot where the lovers are kissing. I enjoy trying to figure out whether the housing project on the screen is in the Bronx or on the Lower East Side. For absolutely nothing, I can get a free trip back to the city. I vaguely recalled someone telling me not to bother with that film. But there I sat in front of the TV. Why not? It was off to an interesting start, with a woman’s voice reciting a poem as what seems to be a Native American woman runs across the snow. But the fact that the film is set in our beautiful valley in the dead of winter, always with whistling winds and deep snow, should have tipped me off: This was not going to end well. The scenes are a snowmobilers’ dream, because our protagonists in law enforcement get to sled everywhere at high speed, passing spectacular stands of evergreens. They remind me of the footage our winter visitors like to put on YouTube after their trips to Togwotee Pass. But the plot entirely robs the landscape of its beauty. A story of brutality against women by ignorant drunken men (not drunken Native Americans, I hasten to add), it ends in a shootout with high-powered weapons. The cinematographer revels in the contrast of the bloodbath against the pure white snow. “So much for the image of our valley,” said my husband as the film ended. This isn’t actually our valley, because the film was set down-county in the reservation. But the river that runs through our town has the same name, and if you Google “Wind River” today the top results, of course, link to pages about the film. As to our town of Dubois, my son (who still lives in New York) commented in a recent visit that the village looks like a movie set. 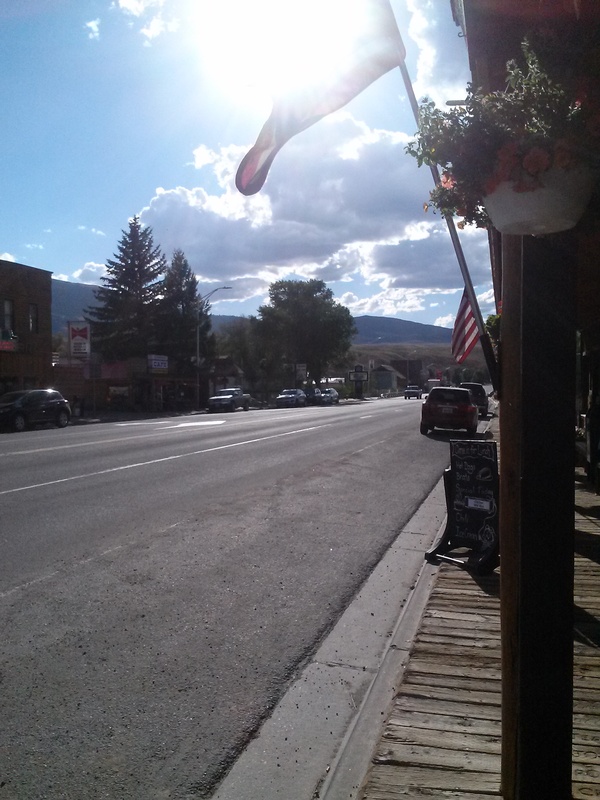 True West magazine endorses that view, having given Dubois its 2018 award for the best architecturally preserved Western town. But the only film ever set in Dubois wasn’t a “Western,” and it wasn’t actually filmed here. I’m gratified to say that Taking Chance, starring Kevin Bacon, was the deeply affecting true story of the return of a fallen Iraq soldier to Dubois and his burial in our local cemetery. This image is not from the film. It’s an actual honor guard at the actual Dubois cemetery, on Veterans Day. Even though locals including Chance Phelps’ family worked hard to bring production here, the Western scenes were filmed in Montana. The business incentives in Wyoming weren’t as good as elsewhere. But also, the costs of bringing the production to this remote area were too high to be practical. This used to trouble me, but as time goes by, I have changed my view. Dubois was extraordinarily fortunate that the one film to feature it gave an accurately positive image of its character–even though the images didn’t actually show our town or our landscape. But it may be a blessing that it is a challenge to bring film producers here. There are many reasons to value our remoteness in this valley. That it discourages the media that might send the wrong message about us is one of them. Lights Down. Leota’s Gone from Dubois. She left the ranch and became a phenomenon. Back in the city, a neighbor’s death was the loss of one thread in a rich tapestry. There were so many others weaving in and out. Here, it’s more like the fading of bands in the rainbow, a loss of our brilliance. In recent weeks, our light has dimmed with the sudden absence of several townsfolk — a beloved young man lost too soon to cancer, an elderly businessman important to the town’s growth, and now Leota Didier. With her passing, I think we’ve lost the bright vermilion stripe. Alas. Leota had a special place in my heart, because she gave us our first glimpse of Dubois when we stayed at the Lazy L&B dude ranch 30 years ago. She and her husband Bernard, a retired Presbyterian minister, had bought the ranch 20 years earlier. That was on a side trip during a vacation in Denver, when she had thought they were headed to California. When we returned to Dubois decades later, I was pleased to find that she was still here. I invited her to tea, and then came to know her better. In the meantime, Bernard had succumbed to Alzheimer’s and passed away. Leota had left the ranch, moved to town, and become a phenomenon. The “L” in Lazy L&B, Leota was hardly lazy. Among many other blessings, she helped to move the historic Dennison Lodge to the center of town, where it became an events venue (and pity the person who left a mess in that kitchen!). She installed large bronze statues by local artists in the town square, and was heavily involved in helping to create the new assisted living center at Warm Valley Lodge, where she spent her last days. I saw her most often when I would help out at the weekly square dance selling soft drinks. She would always sit at the door and stamp hands as people paid their fee and came in. I have great photos of my young children at the square dance decades ago, and I’m sure she must have been at the door back then. Even last summer, after she had moved to Warm Valley, she would never miss this duty as long as someone would pick her up and take her home after. Tall and patrician, she dressed with elegance, even as she grew stooped and slow. Always slim skirts and fitted jackets in the muted colors of the West, and always that signature hat. I bought the sassy red hat below in the thrift-shop auction one year, thinking it must have been a donation from her. That was her style: Classy and bold. She told me she had not donated that hat. Who knows; at that time her memory was fading. I can’t pull it off with her style, so I seldom wear it. But in any case I think of her whenever I see it. “How are you?” I asked, the last time I saw her, only weeks ago, at church. “About as well as could be expected,” she replied, with a gentle echo of her former husky laugh. Typical Leota: Ironic, straightforward, candid. Her devoted wrangler, Max, posted on Facebook about her death, inspiring a flood of responses. Another post said that nobody could fill her shoes. Author LivingDuboisPosted on February 9, 2018 Categories Community Events, Community Spirit, History, Love Letters, People3 Comments on Lights Down. Leota’s Gone from Dubois.